When putting together this month's cover story, our Annual Capital Spending Report, it was encouraging, even shocking, to arrive at our projected 20 percent increase in the food & beverage industry's collective capital expenditure budget for 2011. It was especially surprising coming on the heels of last year's 19.5 percent increase. Now, don't get suspicious here; we don't come up with 20 percent increases every year. Last year's similar surprise followed a projected 2.9 percent drop in capex budgets in 2009, as reported in our April 2009 issue. That turned into an 8.7 percent actual decline when we wrote this report last year, after our reporting companies closed their books on 2009. That means companies budgeted down for capex in 2009 and didn't spend everything in those budgets. The opposite happened last year. As I said, we projected a 19.5 percent jump last April, but you actually spent more than you budgeted, nearly 27 percent more funds in 2010 than in 2009 (even after subtracting Pilgrim's Pride from the equation, which didn't report in 2010). 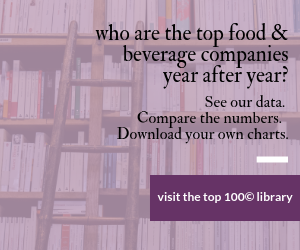 Admittedly, our projections are based on a relatively small sample of companies in the good & beverage industry. We scour the books and SEC filings of 33 public companies, but they're all Top 100© companies and collectively they account for (this year) $17.6 billion in capital spending. That's not the entire universe, but it's a pretty substantial solar system. Projects range from updated truck fleets to ERP systems to a few new bricks-and-mortar buildings (including a $270 million new cheese plant by Leprino Foods). Efficiency is a common thread running through many of the projects -- energy efficiency to deal with the current runup in energy prices and operational efficiency to deal with skyrocketing grain prices and other input costs. The result will be a stronger food & beverage industry, still adept at concocting new products to meet consumer trends but at the same time capable of delivering the lowest-cost foods – and the most of them – in the world. Who's your favorite R&D team? Besides your own, I mean – unless your team is in the running as one of our – actually your – R&D Teams of the Year. Balloting has moved to round 2 in this, our most popular of popularity contests. There are seven nominees in the three size categories all hoping to get your vote: ConAgra and Unilever North America in the large category, Herr Foods, J&J Snack Foods and Shearer's Foods in the medium-sized category, and HappyFamily and Blount Fine Foods in the small-company category. The two previous years we did this, we had 1,555 and 1,350 votes. Help us set a new record this year. Read the descriptions of the nominated R&D teams and the products they've worked on, then cast your ballot. Voting is open now through April 29. The three winners will be profiled in our June issue.